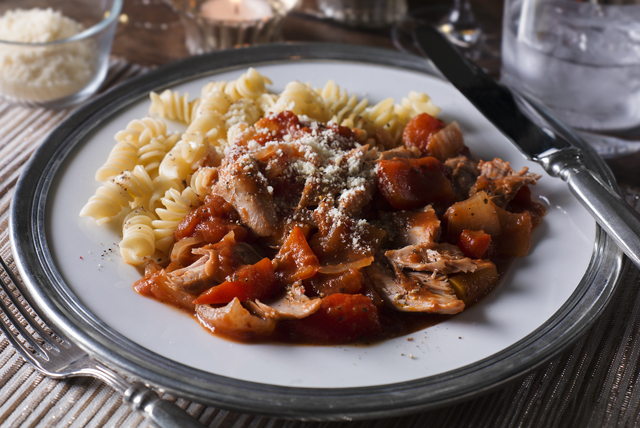 Inspired by sunny Italy, our flavourful turkey cacciatore is made in a slow cooker. It's a convenient dish for big parties, as it looks after itself in the slow cooker. Place drumsticks in slow cooker. Combine tomatoes, dressing, tomato paste and oregano in large bowl. Add chopped fresh vegetables; mix well. Spoon over drumsticks. Cover with lid. Cook on LOW 7 to 9 hours (or on HIGH 5 to 6 hours). Sprinkle with cheese before serving. Serve over hot cooked fibre-enriched rotini pasta. Garnish with 1/3 cup chopped fresh parsley before serving.